Today I received an update regarding the For Love Not Money postcard project from organizer Eileen Foti. The show ended earlier this month, but today she sent a few photos of our cards on display at the museum in Tallinn, as well as a link to an online version of the catalog. 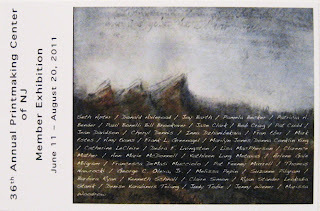 Only about a dozen of the cards are shown in the catalog (not any of mine), but I'm on the list of names of all the participants and the various locations of the 18 international groups. I was surprised to see about a dozen names from Mauritius, so I guess some of them turned up late. (my original assigned partner wasn't on the list) The catalog entry lists 220 names, but there are only 96 cards in the display- all the art sides facing one way, and the address sides facing the other way. I don't know if they selected one card each from each artist pairing or just chose cards that they liked. Either way, one of my cards is present- at the top of the frontmost column of cards. (click on it to enlarge). Still no official word on future exhibitions of this project, but she says that something may be in the works, and I'll get the news out here as soon as I learn it myself. 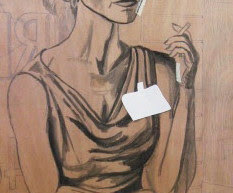 Today I continued work on the smoking figure, exploring some possible changes and making some official. I like the previous changes I made to her nose and cheek contour, but that still left me some problems with the eyes. The shape of the original eye on the left was fairly accurate to her face (verified by the photo), but I think it was part of what contributed to so many people seeing her as angry. I prefer to use references when possible, but rather than try to arrange more time with the model, I decided to tap into another resource at hand. The model who posed for this is the most regular model at the Belmar figure group, and since I tend to concentrate on portraits when I'm there, I already have dozens of drawings that include her eyes. I went through my drawing pads and found the best option, then traced it on a glassine scrap. Taped it in place- looked much better as is and in the mirror (with woodcut portraits, how it will look in reverse is more important). Decided on the exact placement, used some fine sandpaper to remove from the block surface most of the original drawing ink from last year, and redrew the eye with pencil, marker, and india ink. Made slight adjustments to the other eye to make it match better. The results are shown above. The next task was more name tag experiments. I tried the lanyard last time, but didn't like the way it cut through all the horizontals in the torso. The type that clips or pins on is less common, but I do see them around. A few days ago I was at a work related art reception and the organizer was wearing a top similar to the subject of my print. I had her attach my clip-on name tag to both sides of her blouse and took photos of each. Based on those photos, today I cut one out of scrap paper and tried it in different locations. With all things being equal, I think I like it better on the left side (above) than the right side (below). The last item of the day was the arm holding the cigarette. Back last summer when I showed the block at our Studio critique group, a number of people suggested that I move the arm outward a little. The reason given was that vertical was too similar to the vertical line of the edge of the brick wall right next to it. 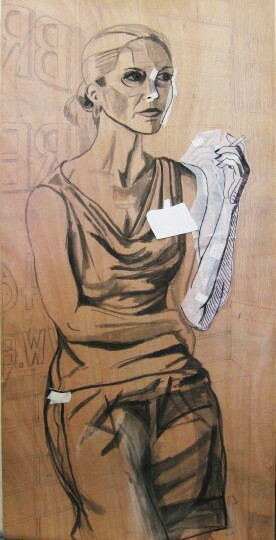 Using another piece of glassine, I traced the whole lower arm and hand, which I then taped to the board at a new angle. Another scrap of glassine covered the original hand, over which I roughed in a shoulder and upper arm- based on some photos taken several months ago. Finally, I moved the name tag back over to that side of the figure, if for no other reason than to obscure some of the newly revealed arm. The result is below. The changed arm position does indeed break up that wall vertical. However, I don't know that I want to make that change. First of all, I think keeping the arm more upright is the more natural position, based on my observation of smokers. (also less likely to burn passers-by) Second, this would much more difficult to redraw than the minor changes to the face. I will wait until I show my various paper additions to more eyes before I make any final decisions on the name tag and the arm. The issue of tattoos will wait until I resolve those. 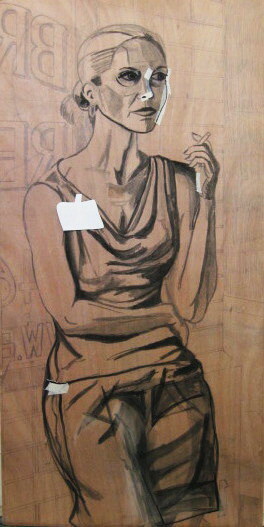 I'll deal with the background after I settle the figure. I made my 2nd trip up to downtown Somerville in less than a week, to pick up the work from the recent Arts on Division show. My prints were still on the wall when I arrived, but my packing materials were located and I quickly got my pieces wrapped up and stashed in my car. I also picked up work for another Monmouth County artist, and over a lunch break (brought a sandwich) discussed PCNJ business with our current director. While I was still up at the former gallery space, I left them my contribution to the upcoming 36th Annual PCNJ Member Exhibition, to be transported back to our headquarters later in the day. This will save me from making yet another trip up to Somerset County in the next two weeks, which I would otherwise have to do. The postcards (shown above) arrived a few days ago. 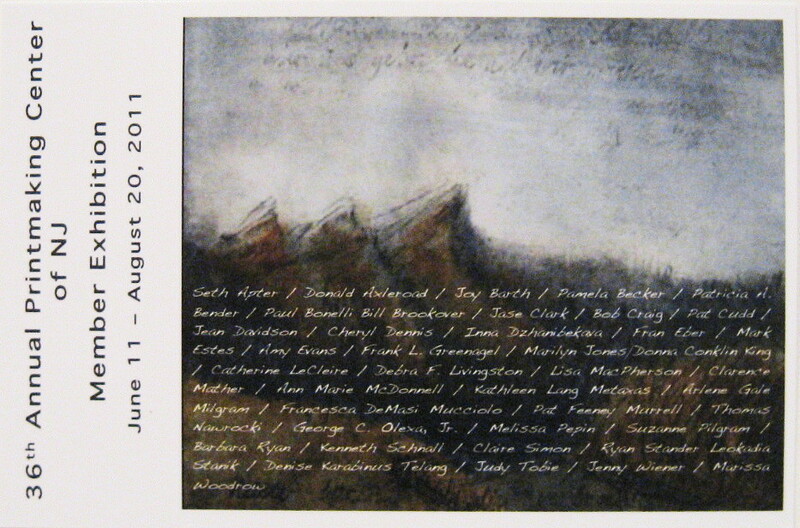 This shows 41 artists will be part of the exhibition- some I know, some I don't recognize. (click on the card and you can read them for yourself) I was told that there were almost 250 entries submitted for the show, so the jurors had a lot of work to choose from. I'm looking forward to seeing the exhibition next month and what got into it. There was time for a Studio visit today, and I decided to start the process of coloring the 3rd proof of the shower print. As with the first two copies, I started by coloring the figures, the one aspect of this image that has been the same in all three proofs. It's as far as I got today, but the rest will go faster than the previous copy, since I'm fairly sure of all the backgrounds and the colors are already mixed. There's no particular hurry to get this done, but I'm not going to move on to the next in the series until I've settled everything with this one. On the way home I stopped at my usual supermarket to pick up some hard rolls for sandwiches and saw something involving a seasonal patio furniture display that could for the basis for a new supermarket print. I'll save the details until such time as it goes into production. A few days ago I posted a link to some photos taken the night of the opening reception at the Arts on Division exhibition and festival. However, by the next day that photo album was pushed back a few pages on the newspaper site that held it, so here are a few photos taken today (Wednesday, May 18th). The main difference, other than a smaller number of shots, is the complete lack of crowds, not surprising on a rainy weekday afternoon. 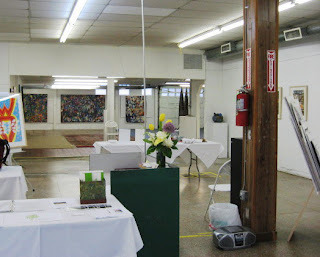 Above is a shot of the outside of the larger gallery, the one that held my art. 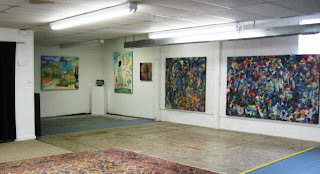 A few of my pieces can be seen through the window furthest to the right. 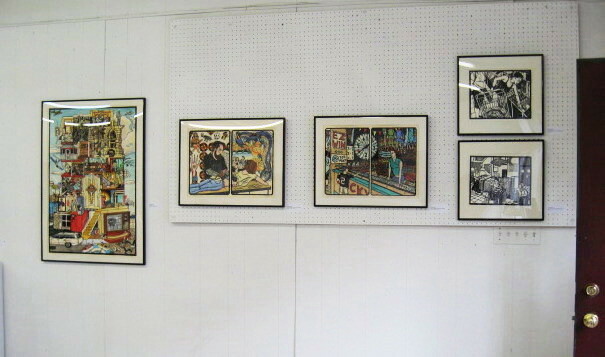 Upon entering the gallery, the first art people came to was my set of five framed prints. During my four hour sitting shift only 3 people came in (and one of those was just someone from a local cable company passing out business cards), but all 3 were drawn the to work (especially A History of Art) and commented very positively, even before learning that the artist was present. Continuing into the gallery (a currently empty storefront), art from PCNJ occupied the front room (the above photo), while art from other area arts organizations filled the large back room and a narrow side gallery. As my gallery shift ended and my relief arrived, several people came by for an author related panel discussion. That was scheduled to begin about an hour later in the gallery next door, which had two good sized rooms with more art from the show. There will be literary related events on Thursday and Friday night as well, and then some music and dance related performances on Saturday, the last day of the festival. The schedule of events can be found on this Somerville website. I got to the Studio this afternoon and found it full of people- Molly was just finishing up a class with a group of Girl Scouts and had neglected to warn me in advance. While the girls were pulling their final prints and cleaning up, I ate my lunch and was ready to work. At first I had expected that I would begin coloring the third proof of the shower room print, at least the stuff that I was sure about, but there was too much activity in the room for me to set up all that. So I went with the other option- getting back to work on my smoking block. 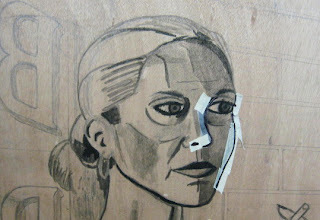 I have known for a long time that there were issues with the face, especially the nose. What I had drawn was a very nice nose, but it was a little small for the face, and not centered between the eyes. It needed fixing, but it's not too easy to erase ink on the wood, so the goal is to fix as little as possible and still make it work. So I just traced the line of the nose (bridge to tip) and just moved it over a quarter inch or so. Adjusted the nostril location accordingly. After studying a photo of the model in the pose I came up with another change, the contour of the cheek on the right side. In the earlier version the furthest out point on the curve was near the cheekbone, but I noticed that it should really be further down, more on the level of the tip of the nose. I tried the correction on a piece of masking tape. 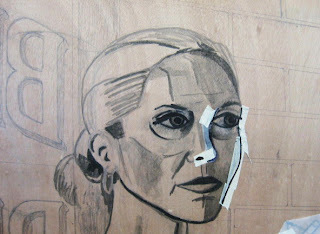 Much better- the less sharp contour takes away some of the extra age the drawing had given the model. The result can be seen above. I've shown this block in multiple critiques and to individuals, and while almost everyone likes the drawing of the figure, so far no one sees the figure as an employee on a smoking break outside based on just the drawing itself. However, that is the point of this piece, and I want it to come across without requiring viewers to read the title. One idea that I've been considering for months is giving her a name tag, since pretty much people only wear name tags when at work. What I've seen most is ID's worn around the neck on lanyards, so I'm trying that idea first. Last time she was in the studio I had the model put on the same blouse and an ID lanyard and got a few reference photos. Had a sketch of that with me today. To see how that would work out I used strips of scrap paper taped to the block. 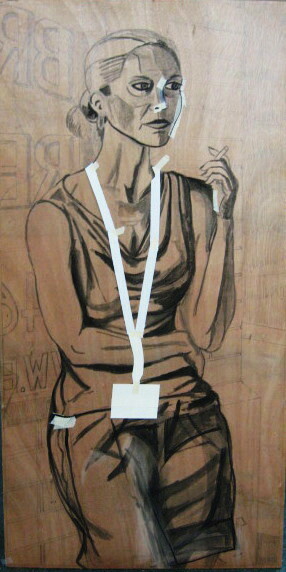 A finished version would not stand out as much as this bright white paper on the natural wood, but it shows about where the lanyard would drape on her. On the positive side, I think it would clear up all the confusion about the subject. On the other hand, I'm not crazy about the way it cuts through all the horizontal lines of the torso and arm. The other option would be name tag pinned to the upper chest. I'll try one of those next time. Made some other minor adjustments, all in the area of the skirt. A lot of people have been seeing it as a pair of shorts, probably a combination of where the bottom of the block cuts off and a heavy dark line that extended far up from the hem line. I can't erase it, but a little fine grit sandpaper lightened it enough to see what effect eliminating it would have. I will keep the results in mind when it's time to cut the block. With the school year drawing to a close I found myself with a rare midweek off day today, and I took advantage of it to get into the Studio and finally finish off this print. I had given it some thought since the last work done on it and came in with somewhat of a plan to deal with the last few white spaces. 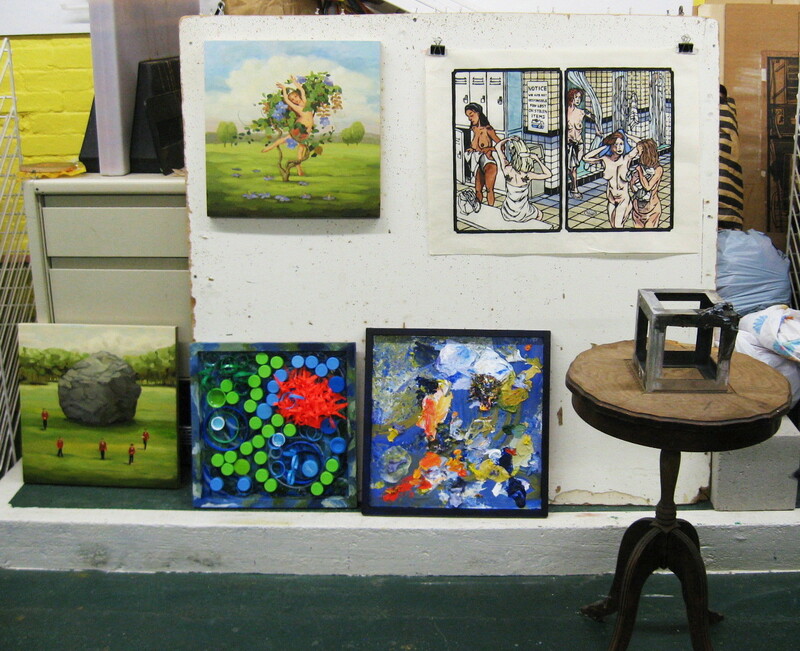 Some things ended up being the same as the first version- the dark red towel for the figure emerging from the shower, a greenish blue towel clutched by the standing figure at the bottom right, the hanging towel in the back being a similar green to the first version, and repeating the ultramarine blue hairbrush from the left panel. Different choices were made for some items in left panel- the bathing suit becoming a pinkish orange color, and essentially switching the colors of the towel and tote bag on the bench, making the bag light tan and the towel deep red. Other late additions- a color for the floor drain cover, a few hints of phthalo wash on the towel (otherwise left white) of the seated figure, and a slightly darker wash on the lower level of wall tiles to make it a little less bright. I think that should just about do it. The finished piece is a huge improvement over the first attempt, while still using a palette that should be compatible with the rest in the series. The overall light in the scene is more like I originally planned, and the figures have more individual presence than the previous attempt. I still have one more proof to color. I'll probably fill in most of it to match this, leaving a few things alone until after the next critique, just in case someone makes a really good case for switching a color or two. But unless someone is really convincing, I expect to color the next one to look like this one, then move on to the next project. Over the next month or so I am going to have several of my prints on display in various venues in the Somerville area. Coming up first is the Arts on Division festival, on Division Street in Somerville. 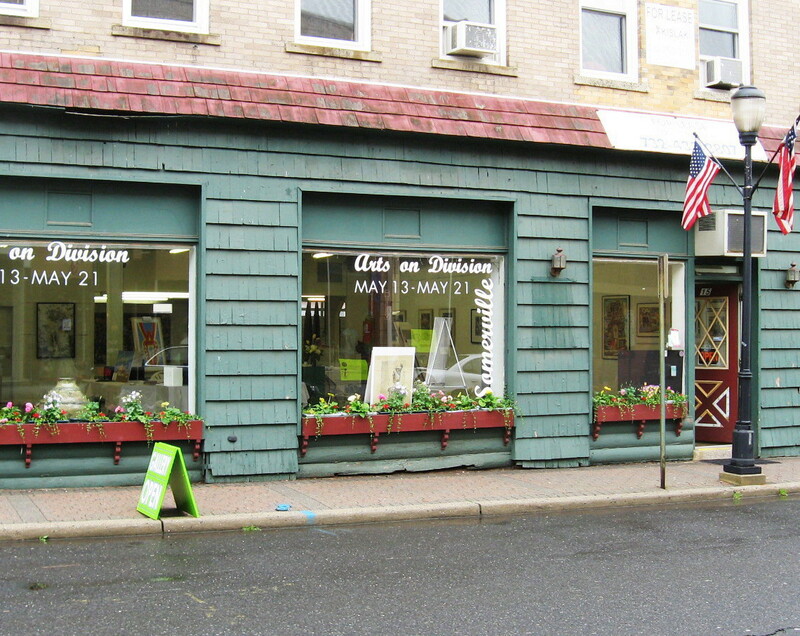 The show will occupy two buildings and contain a variety of art from around 40 New Jersey artists, many with connections to the area. 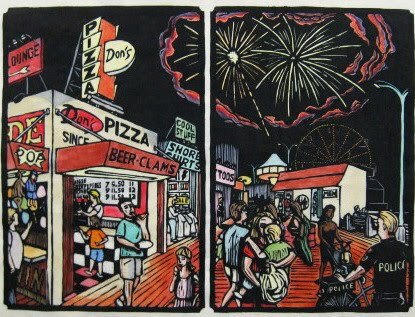 In my case it's because PCNJ is one of the organizers and I will be representing the medium of woodcut. 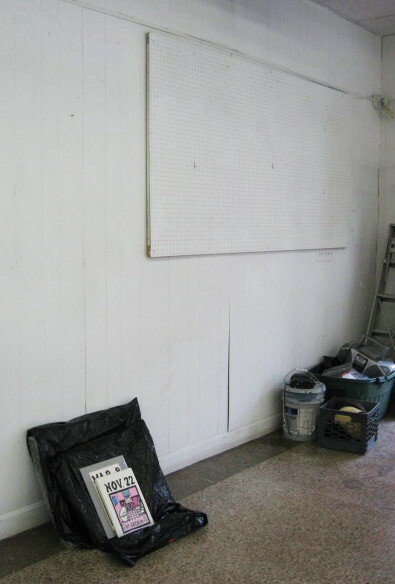 I will have 5 framed pieces on the wall of my space (which is at 15 Division Street, which I'm told is also known as the Berger building) and a few more in bins. The festival opens this Friday, May 13th, with a reception from 5 to 9 pm. 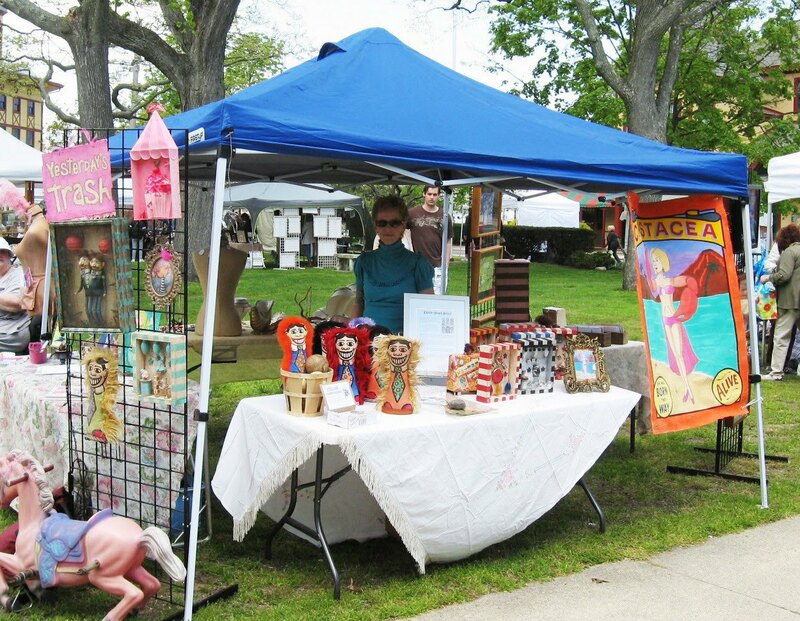 At various times during the festival there will be artistic, theatrical and musical performances and demonstrations in the neighborhood, including a visit from our friends Drive By Press on Saturday, May 14th. 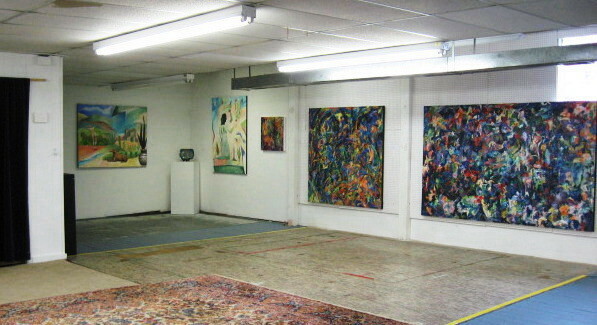 The art festival will run through Saturday, May 21, 2011. Details regarding hours, performances, and special events can be found here. 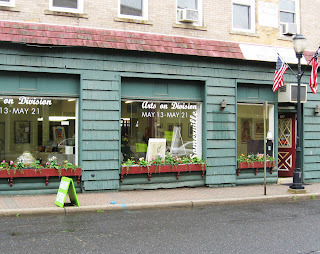 Then in early June, I will be part of the 36th Annual Juried Members Exhibition at PCNJ in nearby North Branch Station. I will be exhibiting the hand colored woodcut shown above, The Floating World: After Sunset. 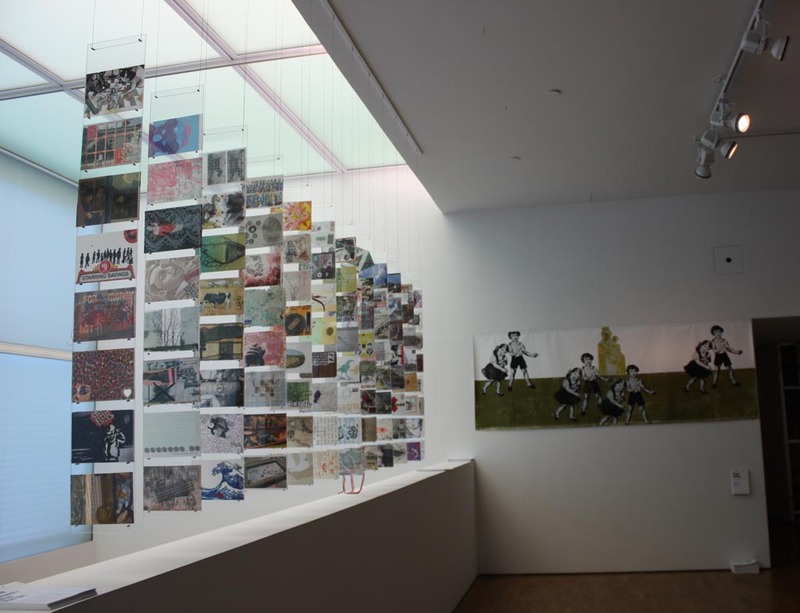 The show opens with a reception on Saturday June 11, 2011 from 1 to 4 pm and remains on display through August 20, 2011 during regular gallery hours. The whole show will later travel to New Jersey City University in September, but I'll post those details later as I learn them. This has been one of those days where I just had a lot of things to do. In the morning I made stops at five different locations just walking around in my own town. There was also a variety of yard work done in the early and late afternoon. In between I was able to get up to Ocean Grove for the purposes of art. I knew that there was a big art and music festival there today, and considered the possibility that festival crowds might be occupying the parking lot at the Studio (it happens now and again), but I only saw a few cars. I walked into town to the area where things were set up, and quickly found my friend Michelle, who is regular at our critique group. In fact, many of the items on sale at her booth (above photo) are things that have made appearances at our critiques, or even were started in the Studio. Since it was a nice day and I was already most of the way there, I decided to continue up to the boardwalk and cross into Asbury Park. Although I'm still not done with the current print, there are a few more to go in the series and I'm considering breaking tradition to have one that includes some Asbury landmark backgrounds. I have dozens of reference photos saved from previous trips, but I wanted to think about a few different views. Here are a couple of assembled images from today's wanderings- looking out to sea past Convention Hall (above) and looking inland toward the boardwalk by the Casino building (below). 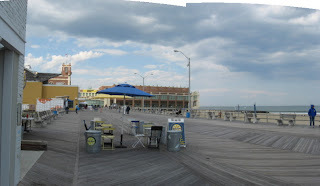 If any Asbury boardwalk locations end up in a print, I'll go back and get some more detailed references. After that I walked along the Asbury side of the lake, looking for some things that turned out not to be there. I walked over to Cookman to find something that was where I expected it, some gelato, which I enjoyed on the walk back to the Studio. Finally it was time to work on some art. After thinking about it for a few days, I decided to go with that green color (previously used in the shower stalls) for the bench. So far I like it. That pretty much just leaves accessories- towels, bathing suit, etc. I hope to have it all finished by next weekend. Today's visit to the Studio included a few diversions- checking out a gallery show in Asbury, printing the last student woodcut of the semester- but I was able to advance my current print a little further. I finished adding the blue color to the rest of the lockers, which seems to be working well. I put an extremely light wash of gray on the tiles on bottom half of the wall, just taking down the brightness a little. I don't know if that's done, but it's so light that I can easily go over it with something else later. A few tiny spots of other colors here and there. I also spent time thinking about the remaining spaces. I made some color strips and laid them over the bench area to see how they'd work. So far I'm leaning toward using the teal green color from the showers, which would separate well from everything around it, while relating to use of the same color in the shower stalls. The towels, on the other hand, are a long way from being resolved. Above is a photo of the two proofs of the print. There is definitely a big difference in the relationship of the figures to the background in the two prints. Maybe this weekend I'll finally finish the rest of the proof. We've had some good models at the figure drawing group in Belmar over the past couple of years. Mostly I go just to keep my skills sharp, which has been helpful because figures are a significant part of many of the boardwalk prints. On a few occasions I have hired some of the same models myself to pose as characters in my boardwalk scenes, and for my in-progress smoking image. I don't anticipate bringing any models to the Studio in the near future, but I can still use the practice. Tonight we had a new model (new for me anyway, she may have worked one of the recent weeks I missed) and sometimes that can be difficult- new features and proportions to adjust to. 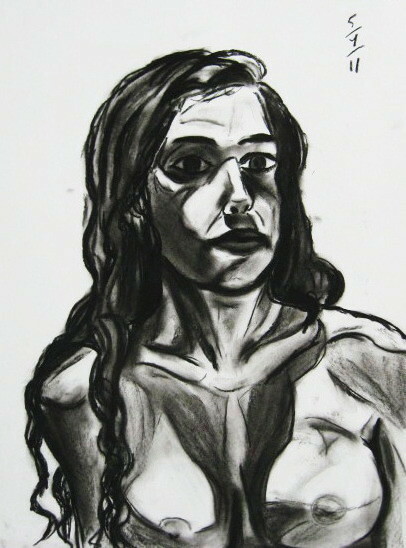 However, things seem to have worked out tonight, as we drew from two 60 minute poses. No great works of art here, but both are better than anything else I've done at these sessions the past few months. The model was impressed with the drawings, at least with the style and use of the medium. 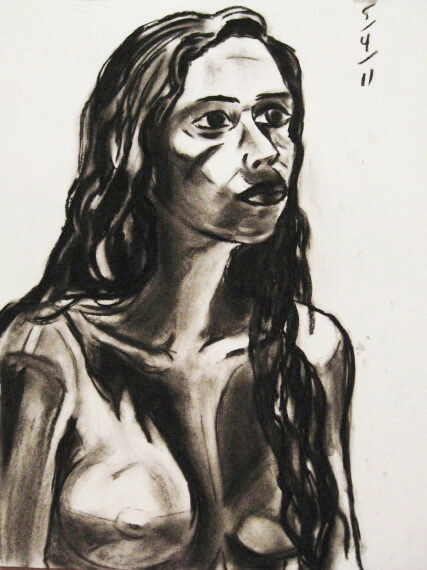 A relative beginner as an artist herself, she specifically expressed a desire to learn how to work with charcoal in a similar way- bold and a bit messy. I wouldn't necessarily advise anyone to do exactly what I am doing here (since I am breaking a few of the rules that I teach in my drawing classes), but I do push my students to go beyond what they know and are comfortable with. So I told her to get some charcoal and have some fun. I also told her that I've been doing this for about 25 years, so not to be too surprised if she doesn't get the desired results right away. Imagine walking into a room and being greeted by a 3 foot tall head, like the one above. 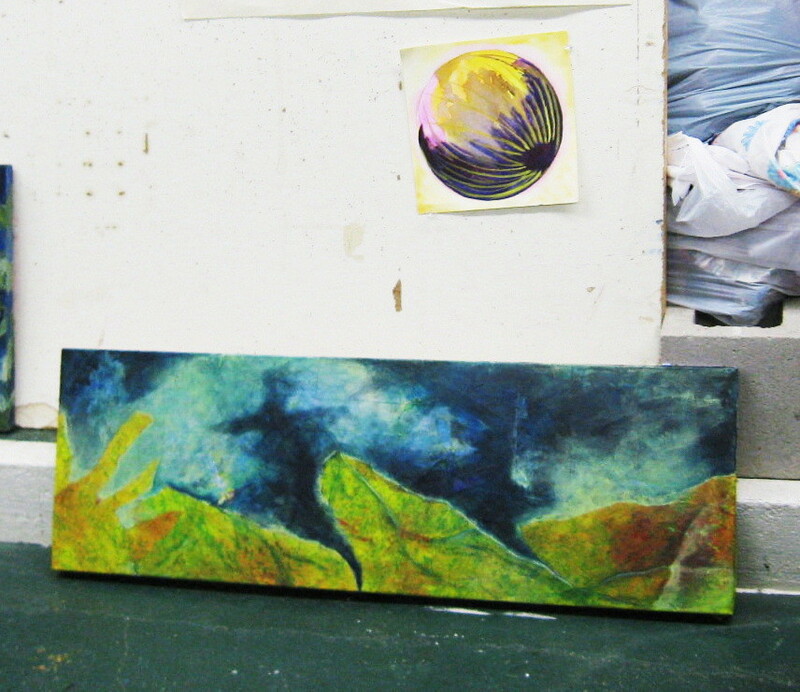 Well, if you were at tonight's critique at the Studio, that is exactly what you saw. 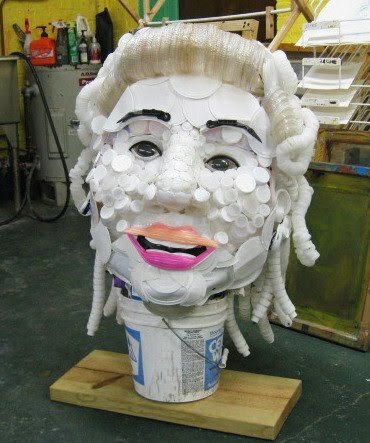 It's the latest from Lisa, one of our regulars who enjoys using cast off plastic objects to form her works. As with most weeks, we started with a small number, but by the end of the night we had 8 artists bring work, and two regulars show up just to talk about the art. 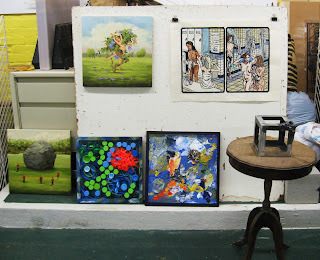 Below is a group of the rest of the early arriving work- oil paintings from Jill, a mixed media painting involving more plastic and an abstract piece from Edy, my current project, and a welded steel sculpture from Adam. 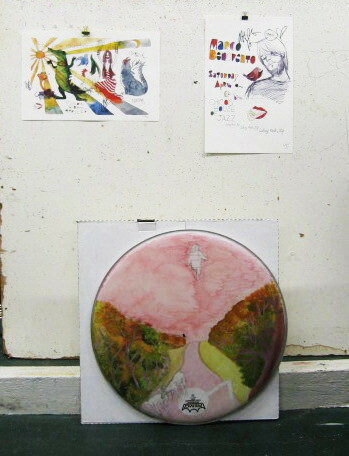 Above are two pieces from Mary- a small mandala, and a significant reworking of a piece she brought to the group a few months ago. Below were two late arrivals both linked to music- small posters for local bands, and an in progress project involving the front of a bass drum. The good news is that everyone agreed that the new color choices I made for the latest proof of the shower print are an improvement over the version from last time. (I showed both, as a number of the people present weren't there last time.) As expected, everyone felt that the figures stood out more. The bad news is that with the figures more prominent, any potential flaws there are magnified. Some present took issues with some of the surface marks on some of the figures, seeing them as distracting. I feel that the revisions that I made with those before the last two printings are enough and the remaining marks are just part of my expressionist-derived drawing style. No agreement was reached tonight, but there's always next time. Had a window of a few hours to get into the Studio this afternoon, so I got up there and went back to work on the shower print. I added a bit of ultramarine in some predetermined spots, but most of the time was spent mixing two colors, both starting with cobalt blue teal and white. To one pile I added a warm color, which pushed it toward green- this color was put into the shower stalls seen in the right panel. I liked it, but I didn't think it would work in a large area like the lockers. To more of the teal and white I added indigo, and a little orange to neutralize it. I tried it out on the side of the bank of lockers. I think it will work. However, I had to call time on the session, because Molly (who had arrived about an hour earlier to do some cleaning) had a large group coming in as part of a class and I figured I'd be better off leaving. So I cleaned up, packed up, and got on my way. I don't think that I'll have time to do any more with this before the critique, but there are enough changes to make it worth showing the group.